We introduced our beer cooler and plastic bag Sous Vide technique in our Beef Sous Vide post. We always overcook pork tenderloin so we decided to try to see if we could nail it with a Sous Vide approach. 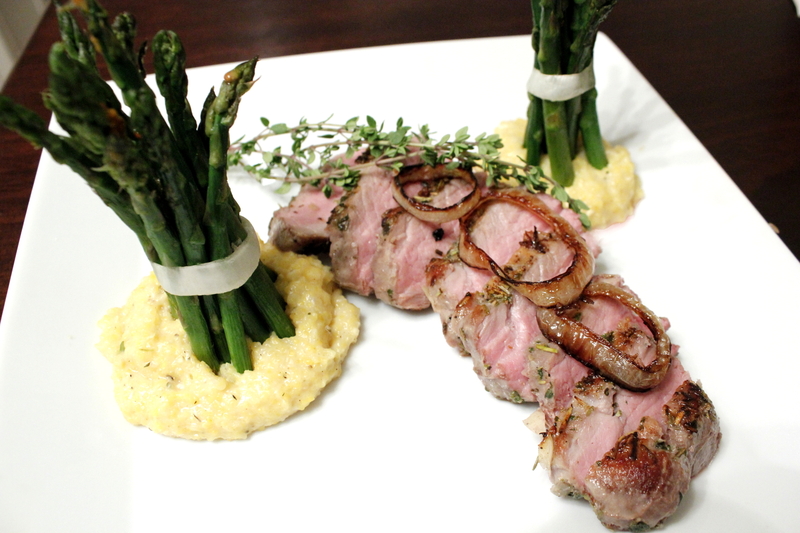 To go with the pork, we roasted some asparagus and took a shot at something we've never made before - Polenta! (which, to our surprise, is just corn grits prepared differently than you do for breakfast). We added some gouda and thyme to the polenta which really went well with the pork. 1. Grind salt, pepper, thyme, rosemary, garlic, and olive oil together with mortar and pestle or back of spoon in a bowl. 2. Rub pork generously with herb/garlic mixture and place in Ziplock bag, squeeze as much air out as possible and seal well. 3. Place thermometer probe in cooler. 4. Fill cooler with water, alternate with hot tap and boiling water to achieve about 150 degrees. 6. About 20 minutes before you are ready to eat, start the polenta by bringing the stock and thyme to a boil. 7. Whisk in grits (polenta), turn the heat to low and cover. Let cook for 15 minutes, stirring occasionally. 8. Heat grill or pan with oil to very high heat. 9. Remove pork from bag and sear for one minute on each side. 10. Remove polenta from heat, stir in gouda and salt. 11. Remove pork from heat, slice, plate, and feast.